We were craving for burger and fries over the weekend so we went in search for macdonalds. Funnily - we cant seem to find it along nathan road. I am sure there is but we were just too hungry and lazy to look anymore. All we could find were starbucks. In the end, we saw this - Kraze Burgers and went in to try it. Kraze Burgers is from korea and its also avaliable in Singapore. But never see it ard before and so i googled it to find its location - its at International Plaza @ tanjong pagar. On the website, it says "gourmet fusion burgers with Kraze's special sauces matched with delicious salads, pastas.. including famous chili fries". Reads good doesnt it? 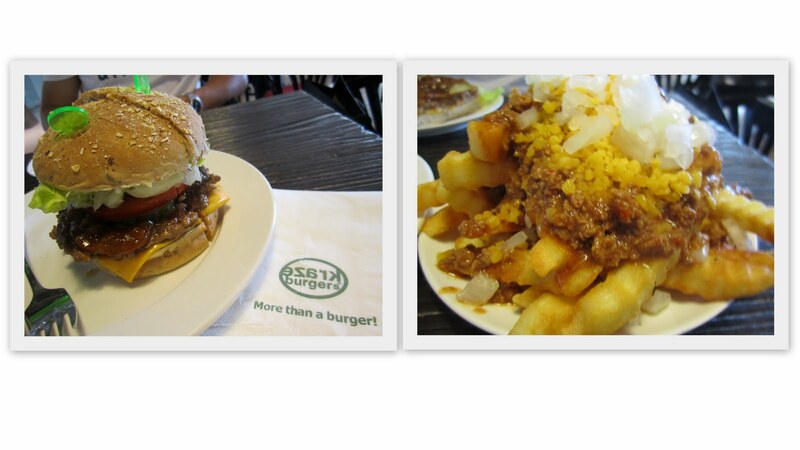 We tried their chef recommendations - the Kraze burger and the chili fries.